Local relationships for any global company are amongst the most important to have, especially when supporting highly technical products such as power chucks and rotary tables. Kitagawa as a worldwide operating company is always expanding their experience and competence in work holding all over the globe. Well known for its standard clamping solutions (e.g. B-200 and BB-200 chucks) in Europe we also offer a wide range of advanced and customized solutions based on the high quality Kitagawa product family. In order to bring this expertise and quality to our European customers we embedded a team of specialists in Germany in early 2016. 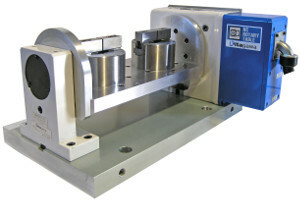 To support you with any workholding challenge for new projects or daily business. The German core team consists of Mr. Daniel Brettschneider from Germany and Mr. Atsushi Ogahara from Japan. 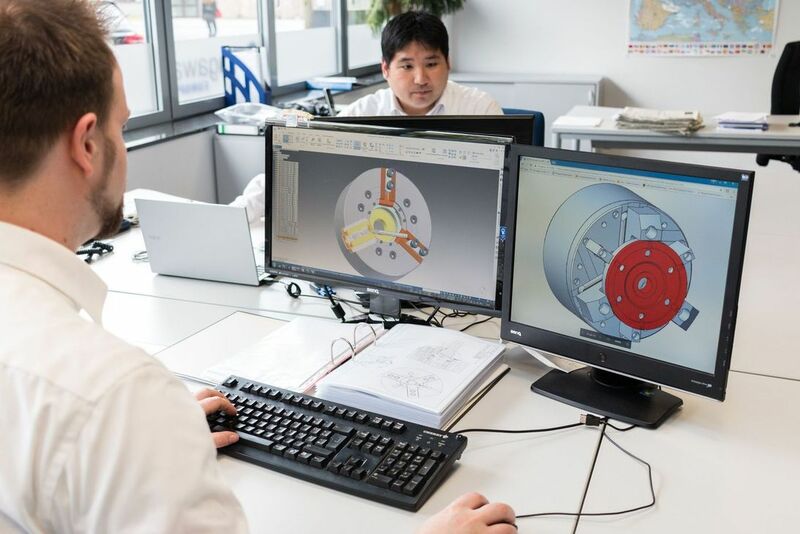 After a year of integration and training Kitagawa Germany is ready and closely connected to all specialists in Japan, UK and the rest of the world. Mr. Ogahara has gained many years of experience whilst at Kitagawa Iron Works, focusing on product development and designing specialised solutions with a team of around 60 highly skilled technical engineers. Mr. Brettschneider started with Kitagawa Germany in 2008. Specialising initially in service/repair progressing to technical sales. 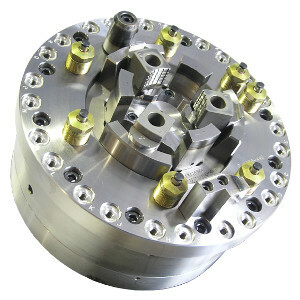 Finally entering the dedicated workholding training program, which has seen him travel to Japan and Europe to give him additional first-hand customer experience. Together with users and machine tool manufacturers we can design product specific concepts and provide advanced solutions. From the beginning of your project all the way through to support during and beyond production start. Please see below a small section on some of our specialist chucks our design team use! The PW chuck is suited to OP10 work due to its jaw pull back action, equalizing function and ability to grip on tapered surfaces. 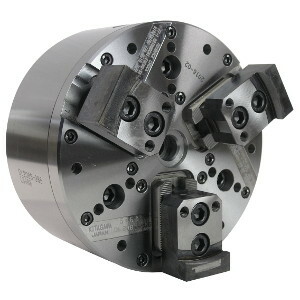 Essentially this chuck allows you securely grip highly irregular and/or rough work piece (i.e. castings & forgings) and enable you to produce accurate machined surfaces. It is very important for the initial operation that the work piece is fixed well enough not to have vibrations or an incorrect mounting. Otherwise the machining surface will be inaccurate. This can then affect the second operation and the inaccuracy continues throughout each operation. The design team will work with you to produce the correct backstop and jaw design to ensure that you work piece is held securely. Suited to second operation work to complement and grip on the surfaces produced in the first operation. The PU Chuck is a highly accurate chuck that has a repeatability of below 5 microns. This chuck incorporates a pull back action, pulling the work piece onto a back stop ensuring secure gripping and long term stable accuracy. Allowing high speed cutting to reduce time it takes to produce parts. 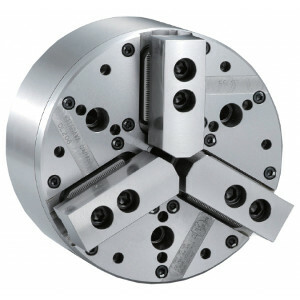 This chuck is ideal for high volume, high accuracy production. 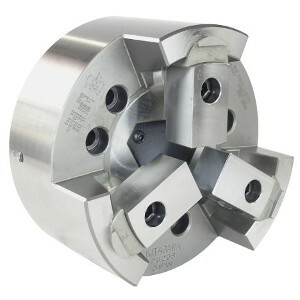 The Dual Lock (DL) Series chuck has all the flexibility of a standard radial gripping chuck (such as the B200 Series ) but it also has a pull back function which allows it to eliminate jaw lift achieving high Z-axis repeatability. 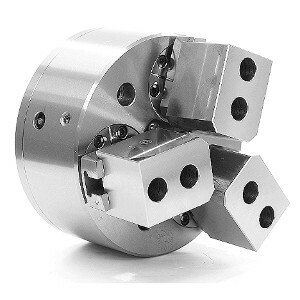 Capable of using standard jaws from the B200 Series this is rapidly becoming the chuck of choice for machinists who want a versatile chuck can be easily set-up for low volume production or high volume production allowing your machine to be more capable. 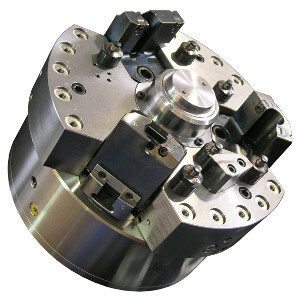 Our workholding solutions are not restricted only to lathes as our power chucks are often installed onto our broad range of rotary tables. 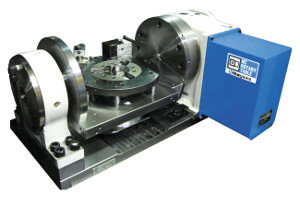 Power chucks (pneumatic or hydraulically actuated) can either be installed directly onto the rotary table spindle or on a trunnion bed as shown. The various pneumatic or hydraulic requirements are delivered to the power chucks or workholding systems via efficient and robust piping design and rotary joints.